Joho’s post from a little while ago about commits and code changes in SVN got me interested. So today when I came across a very cool and very extensive utility appropriately called StatSVN I immediately downloaded a copy of the code. Running it on the trunk took quite a bit of time and ultimately outputted over 480 html and png files, to make a nifty web page on my box. I’ve put some of the files up and I’ll be looking at maybe setting up some of the information for view here on the site. Here was my favorite picture (with a close second going to the fact that our lowest amount of code change comes around lunch time). 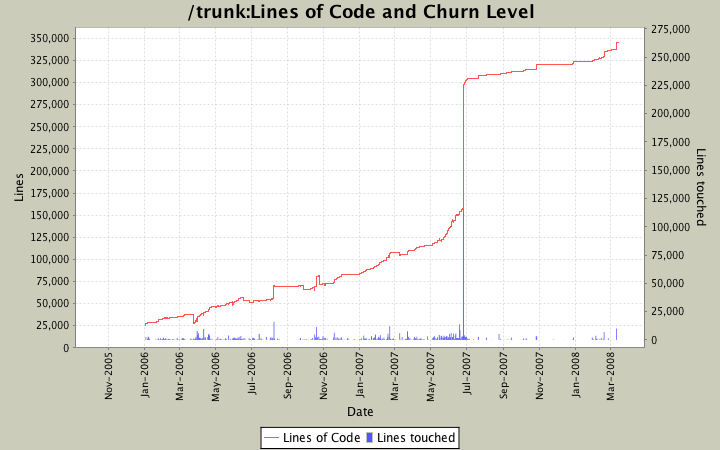 LOC [Lines of Code] and Churn shows the usual LOC with the amount of code touched per day. Hopefully this should go decreasingly towards a release. This entry was posted in Codebase, Dev, Subversion on March 16, 2008 by Tucker Hermans. varied reports suggest that robocup.bowdoin.edu is inaccessible from the bowdoin wireless network: in the lab, in seth glickman’s room, and possible elsewhere. Yes, this means that the blog, and svn, trac, etc. Just plug an ethernet cord in as a temporary measure. I put this note in the blog to get Jeremy to put his thanksgiving laziness behind him and fix this bug. We are currently experiencing problems with the wireless network and logging into Bowdoin web services (Blackboard). Until this is resolved please connect to the network using an Ethernet cable. Let me know if anyone gets another saying that it’s working now. That would be useful. UPDATE::Problem seems to be fixed in the lab. Anyone else having issues? This entry was posted in RoboCup, Subversion, Website on November 28, 2006 by Blog Admin. This entry was posted in Asides, RoboCup, Subversion on October 17, 2006 by Blog Admin. Because I am all that is Robots, I will be presenting a weekly segment entitled ‘Lesson of the Week’ to my fellow cohorts on the Northern Bites RoboCup team. This week’s installment? Managing Conflicts in Subversion. What are conflicts? Conflicts happen when you ‘svn up’ and someone else’s editions to the code have messed with your own. CONFLICTFILE — I.E., this could be Vision.cc or makefile.config or whatever. –Subversion places a bunch of ‘< <>>’ in the code, separating the conflicts between your edits and the other person’s. You can go through line by line and fix the conflicts this way. …Plus three more. Continue Reading…. This entry was posted in Lessons, RoboCup, Subversion on February 1, 2006 by Blog Admin.